Well, the answer I always give is, you need both as they complement each other so well. Lawnmowers do the things that strimmers aren’t really suited for and vice versa. Just try cutting a medium sized lawn of long grass with a strummer and you’ll soon realise you’re fighting a losing battle. Likewise, try trimming off perfect edges or along pathways with your lawnmower, not an easy task to say the least. To sum it up, you need a lawnmower for doing the brunt of the heavy work and a strimmer for tidying and polishing the final look of your lawn. Strimmers come in various shapes and sizes and have a pretty wide price range, but there are only two main categories- petrol and electric powered garden strimmers. In this article I’ll be reviewing the best petrol strimmers out there on the UK market at this time for a selection of budgets. First though I’d like to make you aware of the pros and cons of petrol garden strimmers before we start. The main reason people choose petrol strimmers over electric models is cutting power. You have to look very hard and pay a good deal of money in order to find an electrical strimmer that even comes close to a petrol one when it comes down to power. Another advantage is that they are more mobile because petrol strimmers don’t need a power lead, so you have more range and freedom of movement. There are cordless electric strimmers but they rely on batteries that need to be charged when they run out and don’t last as long a tank of petrol. The not so great things that you have to put up with when using a petrol strimmer are extra maintenance and running costs. You will need to make sure you have a can of petrol on hand and you will also need oil to keep the motor lubricated and to change spark plugs and such from time to time. There is also the fact that petrol strimmers are heavier than electric strimmers, and they can be noisy and vibrate, especially the cheaper models and this can put some people off. Better models usually some vibration reducing features but they can’t get rid of it completely. Finally, like anything that burns fossil fuels there will be fumes and emissions to deal with and they are obviously not good for the environment. Basically, petrol strimmers are better suited to people who either have larger gardens or who are looking for something to use commercially. Time to start our petrol garden strimmer reviews and I’m going to kick it all off with the best petrol strimmers at the lower end of the price scale. Our first review is of this 33cc petrol strimmer from true shopping that is also available with less or more powerful engines ranging from 26cc to 52cc. This 33cc version is for sale for 99.99 with free UK delivery. The 33cc motor is a single cylinder, air cooling, 2 stroke engine that is started via a recoil system and produces 1.2 HP. This power makes clearing out tough weeds a piece of cake. The motor does have to be primed by pressing the bulb under the carburetor and also pushing the choke lever on the back of it, but if these steps are followed this petrol strimmer starts up well. An automatic centrifugal clutch and spiral gear make up the power transmission method. Being a 2 stroke engine there is some smoke emissions, especially when at full throttle, and a little noise but that’s to be expected. The strimming is done by a twin line, nylon cutter and for the brush cutter a 3 toothed metal cutting blade that makes lightweight of anything you want to trim even with grass as long as 40cm and brambles. This is a petrol strimmer so of course that means there is some vibration when you are cutting, however it isn’t too bad and when operating at lower speeds the level of shake is lessened. The materials used in this petrol strimmer’s construction aren’t up to what you’d find on a Stihl strimmer but they are still good quality. The frame is rust proof alloy and heavy duty plastic and it looks and feels robust and hard wearing. As with most things, this robustness comes at a price and the price is an increase in weight when compared to plastic only models. Still, with a bit of adjustment, the harness that comes with the strimmer helps to make the machine feel lighter than its 9.15kg. The handle bar design helps to keep the weight load spread out evenly too. The fuel tank has a capacity of 0.8 litres, which should last a lot longer than any cordless electrical strimmer, and the two stroke oil to petrol mixing ratio is 1:25. There is some assembly required such as fitting the handlebars and safety guard on, but the tools to do the job are provided and it’s fairly straightforward, which is a good thing as the pictures in the instruction manual were a bit small and hard to work out. Having said that, there is a PDF version online that is much clearer. For under a hundred pounds, this 33cc petrol strimmer / brush cutter is good value for money. Obviously there is some smoke and noise from its powerful two stroke engine, but investing a decent pair of ear protectors (which you should be wearing with any petrol gardening product anyway) should see you ok.
Our second cheap petrol strimmer comes to us from Parkerbrand and costs a very reasonable 83.99. This model is a best seller online and has been getting positive feedback from customers and is priced lower than some second hand petrol grass strimmers out there. A 52cc, 2 stroke engine powers this petrol strimmer and it is capable of 2.2kw at 7500rpm. For the layman, it has plenty of power, more than enough to cut through the densest of vegetation. There was some confusion with the fuel mix, as the sticker on the engine suggests 1:40 but the one on the fuel tank says 1:25. I checked online and someone had got in touch with the company and they confirmed it is 1:25. A little annoying but not a big deal. The 2 stroke engine is easy to start, powerful but not too noisy and hardly ever gets bogged down. The build quality of this petrol strimmer / brush cutter is surprisingly good for something priced so low. Everything feels strong and well-made and should last a while as long as it is not abused. Like our previous review, the parkerbrand petrol strimmer comes with its own harness, and it is padded and decent quality like the strimmer itself but I think the design is a little overcomplicated for no apparent reason. The split shaft design of the strimmer frame gives you two long handlebars to hold onto and helps you to control the 10+kg weight of the product. This product comes with two different attachments- a spool fed grass trimmer and a more heavy duty brush cutter attachment. When it comes to the grass strimmer, I would recommend that you buy a few extra spools as you can get through them quite quickly and this goes for all spool fed strimmers. Not to worry though, they are only cheap and easy to replace. When using the brush cutter, it is important that you make sure it is aligned properly before use or you may experience some extra vibration. Correct set up will avoid this problem. Both of these attachments do what they are supposed to do very well and will have you clearing up your garden in no time. Assembly is straight forward enough, but again, the instructions aren’t up to much so I’d suggest looking for videos and such online to help if you’re not sure. The tools provided aren’t up to much either, but this is true for the vast majority of assembly tools that come with products. Thankfully decent tools are cheap and easy to find these days and if you’re going to own a petrol strimmer, you should have your own set anyway for tightening nuts and such from time to time. This petrol strimmer is a steal at such a low price. A great choice for those with a lower budget that require more power than an electric garden strimmer. This petrol strimmer is for sale for just under 160 pounds on Amazon. Actually this is more than a strimmer, it is a 5 in 1 multi-functional garden tool. 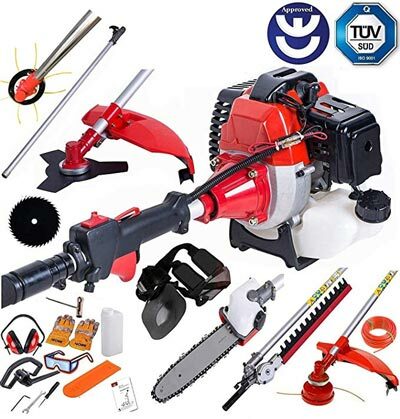 The five functions are- strimmer, brush cutter, hedge trimmer, pruner, and chainsaw. The attachments all fit easily and can be changed without too much fuss. The strimmer is a standard dual line nylon cutting system but this can be interchanged with either a metal 3T brush cutting blade or a 40T blade. The long reach hedge trimmer blade is double edged and made from hardened steel that’ll make light work of your hedge tops. The chainsaw / pruning saw blade is 25cm long and has an automatic adjustable oiler for lubricating the chain. The chain is easily adjusted via a single screw and lock nut. There is also a handy extension pole included in the package and that will give you an extra 105cm of reach when you need it. The box also contains safety equipment such as ear defenders, safety glasses and gloves. A double shoulder safety harness to share the burden of the weight of the product completes the package. The harness works fine with the strimmer / brush cutter, but when I was using the hedge strimmer it kept catching on things. This could be solved by buying a separate universal harness though it’s still a mark down on the overall score of this petrol strimmer. The engine that powers the Bu-ko petrol strimmer / mult-tool is a meaty 52cc, 2 stroke machine that starts easily and produces 3 HP. This should see you having no problems with any of the tasks that you wish to use the multi-tool for, be it cutting, pruning or hedge trimming. The fuel tank has a capacity of 1200ml. Assembly wasn’t the easiest and again, poor instructions that forget to mention things like removing a rubber band so you can fit the handle, and this might frustrate some people. Customer service with this product has been getting good reviews from people and any problems with the product have been dealt with swiftly and questions answered. This petrol strimmer comes with a 12 month warranty. A petrol strimmer, brush cutter, hedge trimmer, pruner and chainsaw for under 160 pounds, what more can I say? Sure it has its faults, as most budget options do, but a call to customer service should sort most problems for you. The hornet petrol strimmer is for sale for 149.99 at the moment on amazon. Unlike all of our previous petrol strimmer reviews, this strimmer doesn’t need to be carried around with the help of a harness. Instead, it can be moved about on its good quality, 12 inch wheels which makes this ideal for people with health problems or disabilities that would otherwise restrict them from using a carried petrol strimmer. Be aware though that because of it’s compact, narrow design, it may have problems staying stable if trying to use this petrol strimmer to cut long, stubborn grass on a steep incline. Power comes from the 43cc 2 stroke engine that gives you 1.75 horsepower and will deal with brambles, weeds, scrub and anything else you point it at. This is a petrol strimmer only, not a strimmer / brush cutter and as such only has the double wire 2.4mm nylon cutting system that most other strimmers have. There are no other blade types or attachments in the box, although a brush cutter can be purchased for 10 plus postage and packaging. The frame is tubular steel that has been powder coated for added durability and the colour finish is a nice red tone. The whole product feels durable and should give you longevity. There is some assembly required, but common sense plus the instructions will get you through it without you losing your hair. 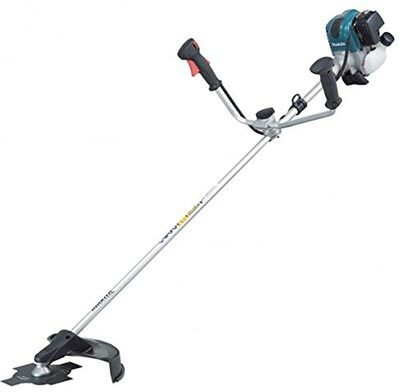 This is a no frills, sturdy petrol garden strimmer that has a decent motor, nice looks and good wheels to get about on. People looking for more features and extras might want to look elsewhere though. Another great buy for just under 100 pounds is this petrol grass strimmer from P1PE. It has some well thought out features designed to make this product accessible and easy to use for all customers. First of all, this petrol strimmer has a powerful engine that was made and supplied by well-known car brand Hyundai. It is a reliable, high torque, 52cc, 2 stroke motor that has been designed with a soft pull start so even people with minimal upper body strength can get this machine up and running and there is minimal kickback from the cord. The engine is fully euro 2 compliant which means it gives off less emissions and is more economical than a lot of other strimmer engines. The nylon cutting wire is fairly standard but the P1PE petrol grass trimmer has a new easy load system for when the time comes to add a new reel. Usually, when we have to change the nylon line, we have to wind it around the spool inside the trimmer head and then feed it through the two holes at either side. This can be tricky if you’re not practiced in it, but P1PE’s new system is far more straight forward. You simply thread the trimmer line through one side and out of the other until you have a metre each way and then wind it back in to the length that you want. The strimmer head has a cutting width of 45cm and this allows you to trim large areas of grass in quick time. If you want to adjust the length of the cutting line, all you need to do is tap it on the ground, so simple. This is a petrol strimmer / brush cutter and so comes with a three tooth steel cutting blade attachment for those more heavy duty tasks. The brush cutter blade has a cutting width of 25cm and with the Hyundai 53cc engine backing it, will easily cut any type of vegetation you want it to. 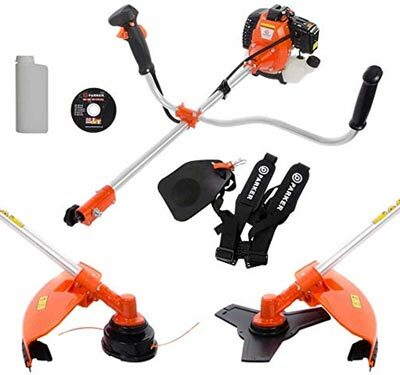 This petrol garden strimmer comes with a harness to help with the 9kg weight of the machine but it is only a single shoulder strap and I would highly suggest investing in a better double shoulder one. Handling the powerful petrol strimmer is made easier by the large ‘cow horn’ shaped handlebars and the on/off switch and trigger are controlled by your fingertips on the right handle. The tools needed for assembly are provided but like almost every other time they are included, they aren’t great quality and you would be better off using your own. Putting this together should take about 20 minutes. The split shaft can be quickly released to reduce its length by half should you want to put in the boot of your car or store it away. Tools supplied aren’t the best quality. 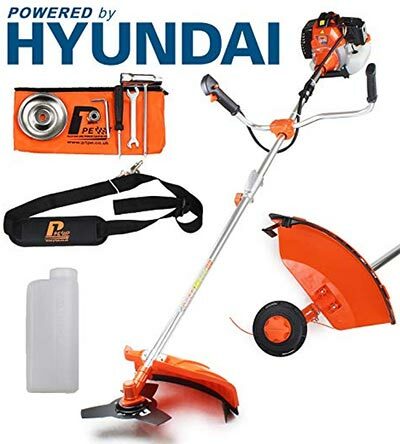 Sporting some nice features like ergonomic cow horn handles, easy to change strimmer wire, easy adjust, Hyundai soft start engine, and for sale for under 100 pounds, this is a very good choice for those looking for a cheap petrol strimmer / brush cutter. 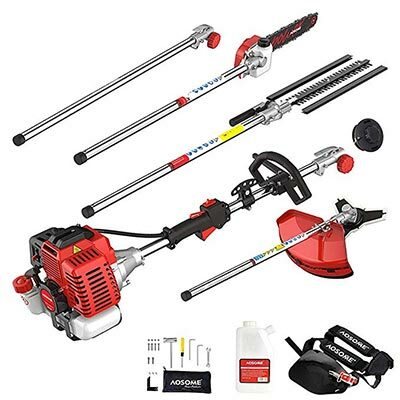 For sale on Amazon for 126.98 with accessories or 99.99 without, is this petrol strimmer from well-known brand McCulloch. 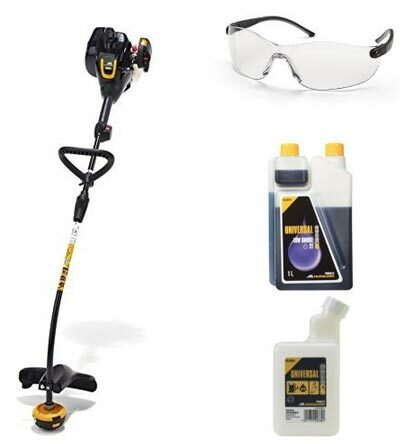 Included in this bundle are the strimmer itself, some fog and scratch resistant safety glasses, a bottle of low smoke 2 stroke engine oil, and a universal mixing bottle for mixing your fuel. The engine running the McCulloch petrol strimmer is a 25cc, 2 stroke block that has a purge button you press to pump fuel directly into the carburetor and this makes the strimmer easier to start with fewer pulls on the cord required. This purge button is very easy to see and access as it is on the side of the engine. McCulloch have taken the fact that petrol strimmers shake a fair bit when operating at high revs and have installed an anti-vibration system that sits just under the engine. They have also seen to it that you can access the air filter without the need of tools and made the fuel tank transparent so you know when it’s getting close to the time to fill up. The shaft can be split in half for ease of transport and storage and the design of the adjustable handle is one that is very compact and space saving. Instead of bike style handle bars, or large cow horns, McCulloch have opted for a small, triangular shaped handle and it is padded and comfortable. The shaft itself is curved so you get a good cutting angle while remaining comfortable. The nylon cutting wire works well and has a tap and go line feed head to keep your grass trimming session as uninterrupted as possible. The reason such a small handle works for this particular petrol strimmer, and also why the lack of a shoulder harness isn’t really an issue, is that it is very light, weighing only 3.9kg. That’s less than half the weight of most of our other reviewed products. You will need to do some assembly to get this petrol strimmer set up but it is very easy and the instructions are ok. This product isn’t without its faults. For a start it is quite noisy while in operation and kicks out 112 decibels so you’re going to need some good ear defenders. Also, this is a strimmer only and can’t be used with any attachments such as a brush cutter and this limits its practicality somewhat compared to its competitors. Lightweight and comfortable to hold and use are the main positives of this McCulloch strimmer, but the noise levels and lack of flexibility when it comes to the jobs it can do might put some customers off. That was the last of our reviews under 200 pounds. There are lot of other cheap petrol strimmers for sale out there but many of them are so similar to the ones I’ve reviewed above, yet often lower quality that I didn’t think it was worth reviewing them. Now let’s move up the price range and look at what you can get for between 200 and 500 pounds in the UK at the moment. Our first review in this category is actually a penny under 200 pounds but I included it in here anyway. Ryobi are known for producing good products that are well made, and this one is no exception. The build quality feels good and not at all flimsy. The engine, a POWR LT2 26cc 2 stroke machine, has been designed to not only be compact and very lightweight, but also to be a ‘clean’ engine that produces less emissions than most petrol garden strimmers, so you can feel good about doing your bit to save the planet. Despite being lightweight, it gives out plenty of power and won’t struggle with even the toughest brush once the right attachments (sold separately) are connected. The cutting is done by the usual nylon wire, but this model has Ryobi’s ‘ReelEasy’ bump feed head to keep you ticking along smoothly. 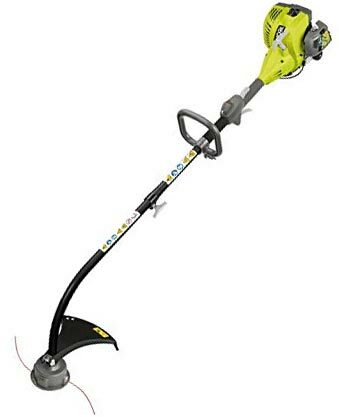 The Ryobi petrol line trimmer has a cutting large width of 43cm that should help you to cut down on your trimming time. The shaft can be split half its length for storage or transporting the unit around, or you can purchase an extension attachment if you need more range. The shaft is strong yet lightweight like the motor and the whole strimmer only weighs just over 5kg. This makes it easy to move around and control with the compact D-shaped handle without the need for a harness, although I’d still recommend using one if you’re doing anything but the smallest of jobs. If you look around, you can probably get a free harness when you buy one of Ryobi’s attachments. Complaints I have are- the instructions are once again bad. The pictures are too small and not clear. Also changing the spark plugs on this model is no lean feat, in fact it is downright tricky and a bad design flaw. Finally, for nearly 200 pounds, I think there should have been a shoulder harness included just in case or at least a brush cutter attachment. This petrol grass strimmer from Ryobi is of a good build quality and has good power to weight ratio as well as being low emissions, but the fact that there aren’t any attachments included with it and the poor instructions, plus the difficulty in changing the spark plug lets it down a bit. Makita have made themselves a very good name of the years by bringing us hard wearing, functional tools. For 285 pounds you can get this strimmer / brush cutter and know you’re in good hands. The main difference between this particular petrol strimmer and all our previous reviews on this page is the engine. All the other strimmers we have looked at so far have had 2 stroke engines. These engines are good for producing power out of smaller engines, but they are also generally a bit noisy, smokey, and you need to mix the fuel with the oil correctly. With their EBH252U model, Makita have chosen to go with a 1 horsepower, 24.5cc 4 stroke engine instead. This engine is quieter than 2 stroke types and the clean exhaust system makes sure minimal emissions are released. 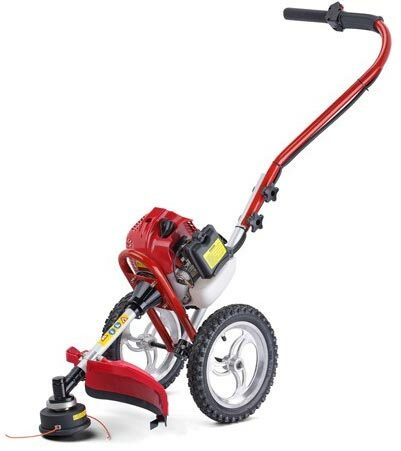 It is one of only a few 4 stroke petrol strimmers for sale in the UK at the moment. The engine has automatic decompression to make starting it easier and there is also a primer pump for cold starts. There is no need to mix your fuel with oil, you can simply use ordinary unleaded petrol. The fuel tank has a large opening for easier refuelling and it is translucent so you can see when it’s topping up time. Fuel capacity is half a litre. This Makita petrol strimmer is controlled by large cow horn style handlebars that have soft rubberised grips for comfort when using it for longer periods. It is fairly lightweight, tipping the scale at around 10kg when fitted with the brush cutter blade, harness and a full tank of petrol. The harness that comes with this petrol garden strimmer is a high quality, double shoulder straps type, is very comfortable and even has a stomach pad. The harness does a great job of distributing the weight out evenly. The bump feed nylon wire strimmer head and metal blade brush cutter can be changed over easily and share a universal guard. The cutting widths for these heads are 40cm for the strimmer and 23cm for the brush cutter. I have to say the nylon wire head doesn’t seem to have been built to the same standard as the rest of the product and the plastic didn’t feel as though it would last that long. The Makita comes with 2 hex wrenches and a socket wrench to help you get this garden strimmer up and running and there is also a free accessories bag in the box. A heavy duty, hard wearing brush cutter that runs quietly and doesn’t kick out much smoke. Only let down by the quality of the plastic on the strimmer head. For 340.99 you can get this multifunction gardening tool from AOSOME. Like the other multifunction tool we reviewed, this product can be used as a strimmer, brush cutter, hedge trimmer, pruner and chainsaw. The difference with this one though is it is much higher quality and has a very powerful motor backing it. 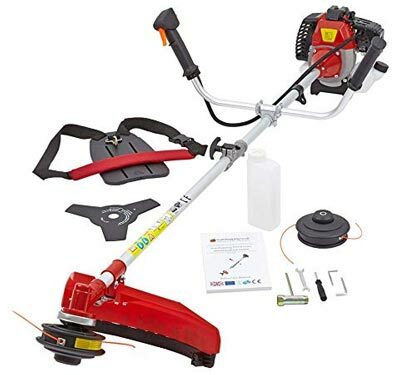 Powered by a # horsepower, 52cc 2 stroke engine that has a max speed of 9000 RPM, the AOSOME multifunction gardening tool will cut through anything. You can even use the chainsaw attachment to cut some small trees to use as firewood. The engine starts up easily, and has a good sized fuel tank that is protected by a strong metal bracket and prevents accidentally damaging it when you put the unit down on the ground. Everything about this product is high quality, and that does not exclude the grass strimmer function. The garden strimmer head has a new design that allows you to reload the nylon line without dismantling the unit itself, saving you time. The strimmer is the tap and go type that is becoming more and more popular with strimmers these days. The brush cutter uses the same shaft as the strimmer head, which has a 3 toothed hardened metal blade. The hedge trimmer sits at the end of 390mm long holder that is made of good quality materials like the rest of this product. The blades are spaced 19mm apart and it can cut branches up to 5mm in diameter. The working angle can quickly be adjusted by hand from 90-270 degrees and when used with the extension pole that comes with this set, has a huge reach of 320cm. The durable chainsaw/pruner has a useable cutting length of 250mm and, like the other attachments, weighs around 8 kilograms. Again, the quality of the materials used and the workmanship is top notch and really inspires confidence that this product is going to last you a long time. The only thing I don’t like about the chainsaw is that it has to be used on the end if the pole and can’t be detached and used close range. The quick connectors used instead of standard screw are large knobs that are much easier to use and really help to speed up assembly and also any adjustments or attachment changes you want to make. They are made of plastic, but it is heavy duty plastic and won’t be falling apart anytime soon. The harness that comes with this package is a double shoulder type with quick release coupling. The padding is very comfortable and there is a stomach pad for extra protection and comfort. The harness works well to spread out the weight of the strimmer evenly. The manufacturer’s are very confident in the quality of their product and have offered a 1 year warranty. Chainsaw must be used on the pole and can’t be detached. This is an excellent product. There are plenty of attachments and extras and all are heavy duty and well made. All of this and a powerful 52cc engine for under 350 pounds? A great deal. Well, that last product brings us to the end of our petrol strimmer reviews UK for now. AS more products and innovations are introduced into the market in the future, I will edit and rewrite this as necessary so as to keep it up to date with the best petrol strimmers for sale in the UK. We also have similar pages with reviews for both corded and cordless electric strimmers, so if you are interested please take a look.